AN ORGANIC GENTLE EXFOLIATOR WHICH PROMOTES SOFT HEALTHY SKIN! Safe to use on ANY Skin Condition. -Moisturizing microdermabrasion will remove dead skin using a gentle fruit acid without harming your sensitive skin. -Restore and Nourish your skin gently during exfoliation using organic SUPERFOODS. -Men love it - it's unscented. -Perfect for baby's sensitive skin issues such as cradle cap. -Very gentle yet effective formula for removing dead skin while repairing facial skin conditions like rosacea, as we use positively charged ingredients which act like MAGNETS to pull out toxins from the skin. - Manuka Honey, a powerful medicinal honey, is an anti-fungal, anti-bacterial and anti-viral. -Aloe Vera Barbadensis is our base, soothing the skin, unlike most exfoliators which use water to cheapen the product and sulfates, sugars, nutshells and salts cut and harm your skin. - Cehami, an Australian botanical reduces redness, itching, inflammation and pain. -PHed at 5.5 to match the skin exactly - works with it to BALANCE it out and create SUPER SOFT skin. Rebuilds and maintains your ACID MANTLE, your skin's own natural protector, vital for health as well as natural oils to be retained. -We are Family owned and have thousands of satisfied customers, so with complete confidence we can give you this guarantee.We will help you with any questions you may have in your journey to creating new, healthy, beautiful skin! Don't wait! Start protecting your skin with this amazing natural exfoliator and speed up the healing of your skin condition! Click ADD TO CART button to order above and see the results you've been waiting for. 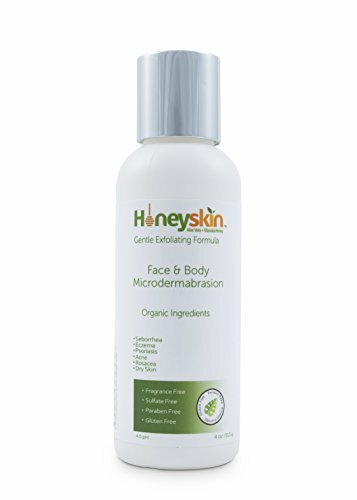 Gentle and effective exfoliating microdermabrasion, removes a layer of dead skin using a gentle fruit acid as the Manuka Honey clarifies with anti-bacterial, anti-fungal and anti-viral properties, leaving your skin SUPER SOFT and GLOWING. We don't use sugars, salts or nutshells which tear up the skin, cutting it and leaving more dead skin. Instead, we use rounded biodegradable ingredients which are postively charged acting like MAGNETS to pull out the toxins and bacteria fromyour skin, including pesky dust mite carcasses (sorry). Designed for sensitive skin, rosacea, eczema, psoriasis, etc. Essential to speeding up healing is to keep the dead skin away!